Please refer to our stock # 1861 when inquiring. 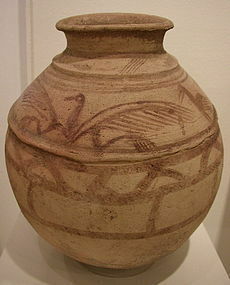 This large wheel thrown storage jar from Susa, Southwestern Iran, ca. 3rd millennium BCE, has a buff spherical body with a short neck and a wide mouth. The shoulder is decorated with two spread wing eagles facing left and two smaller birds in profile. The remainder of the body is ornamented with wavy lines. 14 1/2" high x 14 1/2" diameter. This particular eagle design has been found on numerous vessels excavated in Susa and nearby sites between 2400 and 2200 BCE. Some minor chips to ridge and some incrustation; otherwise in wonderful shape. For further study, see Kawami, Ancient Iranian Ceramics from the Arthur M. Sackler Collections, New York, 1992, pp. 54-55 and 58-59.